Editor’s Note: For maximum understandability, please first read this article’s contextual prerequisite: Where The Buffalo Roamed. 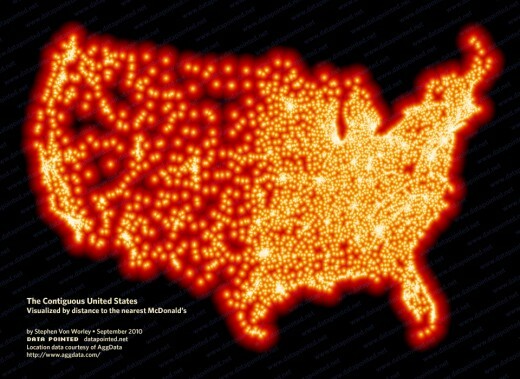 The United States, visualized by distance to the nearest McDonald's, September 2010. See the westernmost gap, a few hundred miles inland from the Pacific? It was there. Did our missing McDonald’s go down in a flaming river of fry grease? Succumb to a local rancher’s beef and run off to Vegas to get married? Or was it a phantom data point – as the kids say, a glitch in the McMatrix? We may never know for certain. However, we have confirmed that a grand total of zero (0) Micky Dee’s currently exist near the location in question, where instead, a 150×200-mile swath of McNothingness has opened up and swallowed the arid confluence of California, Oregon, and Nevada. Because per our calculations, the winds of McDistance have shifted – from your lovely rolling grasslands to the dusty Western outback. There, in the high desert of northwestern Nevada, you’ll find antelope, wild horses, and the Lower-48′s new-and-improved McFarthest Spot: a patch of sage and soil that is 115 miles away, as the crow flies, from the nearest McDonald’s! An aerial view of the McFarthest Spot. View it larger. Update #1: A Visit To The McFarthest Spot. Many thanks to Aggdata for supplying the geolocated restaurant information that made this article possible. Previous Article: Have We Been Spammed?